At our clinic in Wimpole Street, London, prosthodontist specialises in the cosmetic (aesthetic) restoring and replacing of teeth. Making these improvement will restore an attractive smile. Other procedures included in prosthodontics treatment can be implant restoration, and the treatment of (TMJ), temporomandibular joint disorder as well as the rehabilitation with prostheses, of occlusion. 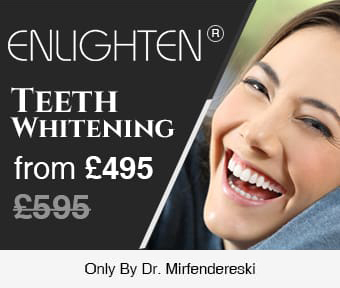 Dr S Mirfendereski is a registered Prosthodontic specialist. Prosthodontics is dentistry focusing on the various prosthesis used in dentistry. This speciality deals in diagnosis, planning treatment, the rehabilitation and continued maintenance of overall oral function. Comfort and appearance and the overall dental health of patients giving rise to deficient or missing teeth as well as oral and maxillofacial tissues, are also addressed with the use of substitutes that are biocompatible. Choosing a prosthodontist who has extensive experience and advanced knowledge, as well as using the latest in technology is always the best idea. Prosthodontists specialise in replacing and restoring teeth. In addition to dental school graduation the prosthodontist will have completed additional advanced training and education through a graduate programme in prosthodontics. Prosthodontists can also provide services like fillings, crowns and veneers according to the specific requirement of each patient with treatments ranging from minor interventions to more complex treatment. Prosthodontists can offer a patient a choice of many options for the replacement of missing teeth. If a patient needs a complete denture, a partial, removable denture, implants, a fixed bridge or any combination of these treatments, Prosthodontists will be able to provide high-quality solutions. With a comprehensive understanding of dental laboratory procedures, prosthodontists work closely with dental technicians making sure that every custom made prosthesis is comfortable, functions well and is attractive. The oral implant has revolutionised dentistry today is the oral implant that is a service that that Prosthodontists have been pioneers in. over the last thirty years they have been in at the forefront of research into the development of dental implants. As an alternative to the more traditional tooth replacement options, dental implants have enormous advantages. This is fast becoming the state of the art treatment for patients who have lost all or some of their teeth. Cosmetic dentistry is a major part of a prosthodontist's work. For a single restoration or a more extensive rehabilitation, there will always be a common denominator: the artificial component will have to blend with the general oral environment. Any procedure a patient is prescribed must be functional and comfortable but will also have to faithfully reproduce form and enhance aesthetics. As the general population generally keep more of their own teeth as they grow older and are also living longer, prosthodontists play a key role in helping today's patient achieve and maintain an attractive and healthy appearance. Prosthodontists will also offer teeth whitening and bonding treatments as well as colour matching and veneers to help reshape the teeth and enhance the overall appearance, and the precise placement of fixed prostheses like bridges and crowns. Prosthodontists combine the care of a health care professional with skill of an artist in the creation of healthy natural-looking restorations. The training for a prosthodontist includes in-depth study of the teeth and jaws. In combination with other specialists, Prosthodontists can provide treatment for patients with birth defects like cleft palate and other conditions like TMD. They also treat traumatic injuries as well as complex restorations for those patients suffering from head and neck cancers who have had surgical and radiation therapy treatment.